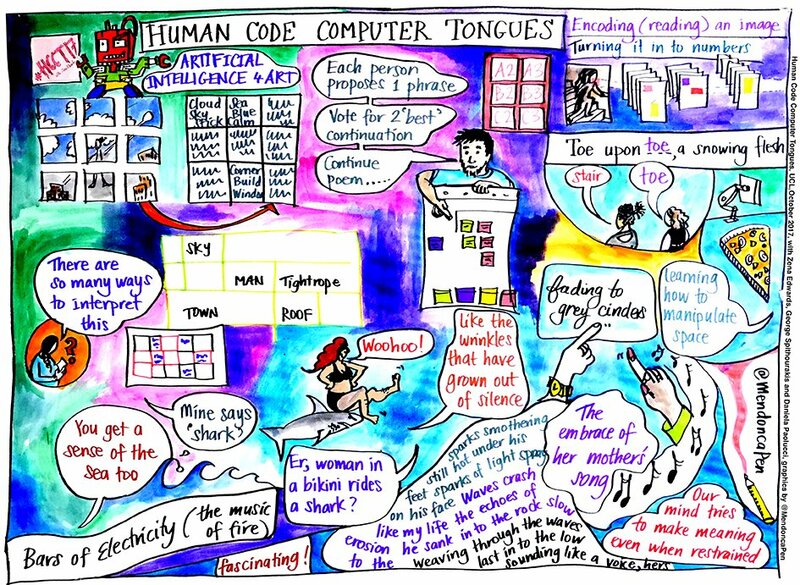 Human Code Computer Tongue (HCCT) took a second run around the conversation of Artificial Intelligence and Creativity. In February 2017, a collective of poets and tech heads came together for HCCT to explore what the future of AI in creative spaces means for humanity. 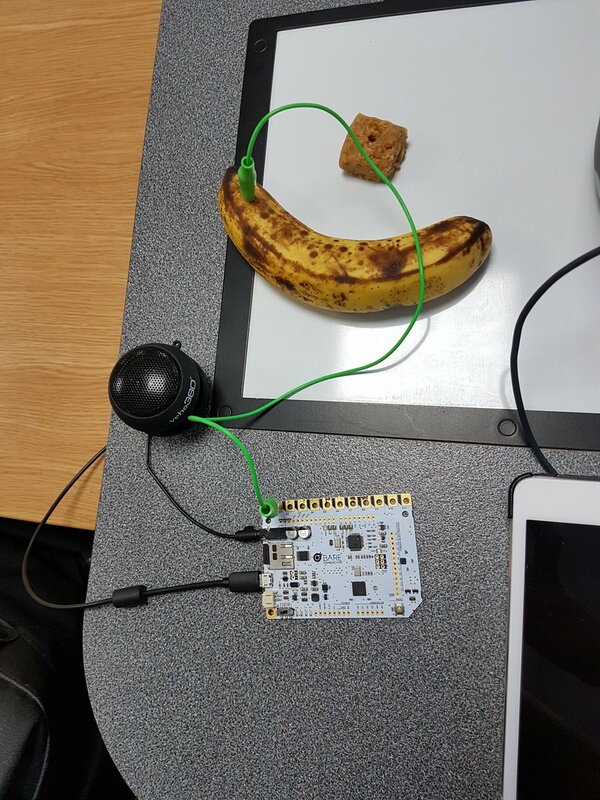 An open call-out to linguistic code developers and poetic creative writers who were serious about technology invited them to explore the futuristic potential technology will continue to have on the process of creative writing and creating art. It was a risk using poetry to explore the bigger themes of AI’s impact on our lives and the world, as it is such a niche case study. It could trap the language in impersonality, devoid of emotional nuance, and stuck in the left brain workings of linguistics. This would omit the crucial conversation of AI’s impact on our imagination, the muscle of human creative innovation. On the contrary, the discussion we passionate and layered. Technology reveals our evolution. It exposes the frontiers of consciousness we can command and conquer. Big talk. AI’s grip on our imaginations and our realities will always involve big talk. It ignites excitement, yet emboldens dissent as mobile devices enhance our commercial lifestyles of convenience, information sharing, daring social interaction, nefarious activity and testing the temperature of the political climate. We see AI’s role in systems that administer everyday civic services,. It’s involved in how we move about the world, in our education, infiltrating our domestic life. Its getting cosy in our close personal intimate relationships. Three generations have grown up with it and can’t imagine a world without it. 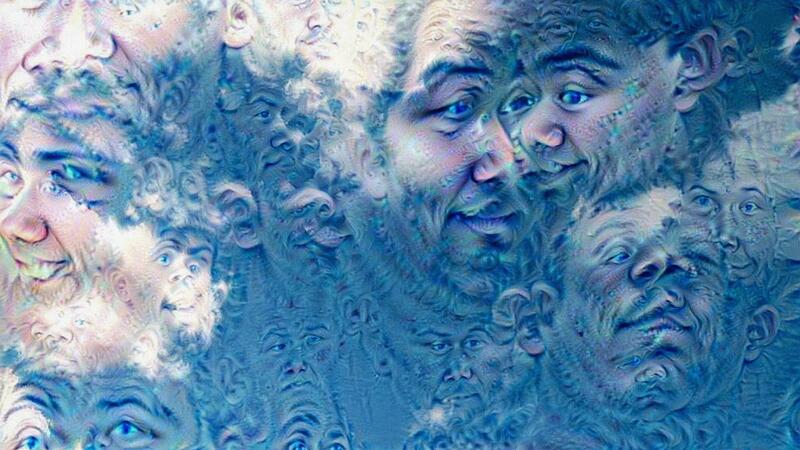 Further advances in AI explore the possibilities of art creation. When we ask, does AI have imagination, we are asking does AI has an intelligent consciousness separate from human ideas of what consciousness is? All very abstract and philosophical, however The ‘exoticness’ of this (potential) consciousness further shapes the vision of what human consciousness is and asks where the boundaries of both are if one consciousness, (human) is the creator of the other? Given that AI has enough algorithmic decision-making authority in the everyday runnings of our lives, where will a potential AI consciousness take us? And within the limits of our human consciousness, how sure can we be of the decisions AI might make? AI is Political and Funny..
HCCT:Rmx deepened the conversation, causing moments of high tension and opportunities for loud bursts of laughter – a sort of relief residing in satirical humour – when talk turned to the political implications of an industry dominated by a white male presence. I always have invited special guests come to HCCT events to give dynamic and creative examples of how AI is used in the real world. Guests who shine spotlights on issues of representation and equality in AI, the gender and race balance in the tech industries and digital justice in society. Xana, gave a thought provoking talk and demonstration of how she fuses tech such as conductive paint (and the electric current of fruit) to trigger sound and loops in her live performances to create performance poetry and song to raise awareness and provoke thought around ideas of representation and an equitable and equal inclusive future in tech. Does AI have inherent bias at its inception? It is hard to ensure a future that is culturally diverse if tech industries are are not reflective of the people who use it. if it is homogeneous where it matters most, the imagination and creation phases will suffer. Omission of cultural imprints from different communities limit accessibility to new schools of tech thought and entry to the industry itself. It turned over £170 billion in the UK alone in 2015 and opportunities for employment tech should be open for all. We want to examine the storytelling around AI to further our understanding of the gap between the mythology of artificial intelligence presence and the actuality of its advancements. Film is where the conversation does not shy away from the more sinister shadows of AI’s unknown. It is these gaps that time to time freak folk out as our imagination runs Classic movies such as Bladerunner, The Matrix and potential iconic movies such as Her, Moon and Ex Machina, invoke the eery speculations about AI running the future without the ‘trip switches’ of organic processes such as human morality, empathy, emotion…let’s just call it the human touch. 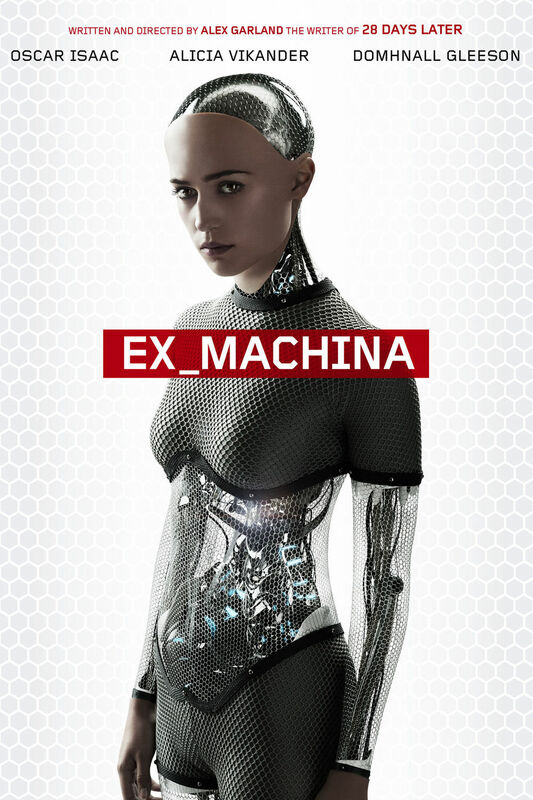 But all three films are great stories that interrogate human sensibilities, embodiment and anthropomorphism, the ethics of the parallel evolution of humanness and AI robotics. And its an unpacking of the stories and metaphors that govern how we interact with each other that Piotr Mirowski brought to the day with his AI improvisational comedy theatre. This is ventriloquism AI style. Albert (Piotr’s alter ego) encouraged poet and arts producer Bella Cox to open up to A.L.ex ( Artificial Language Experiment), a mini bot with a surreal sense of human humour tinged with a dry irony at its own existence as a comedic device. Through SIRI-like processes to input data (the conversation about why Bella has writer’s block), A.L.ex responses were punchlines and set-ups for spontaneous comedy moments. “Seeing human experience is why we got to theatre,” Mirowski says, and A.L.ex is just another character to play with the notion of our human experiences. A.L.ex took its role in creating an improvised the world very seriously. 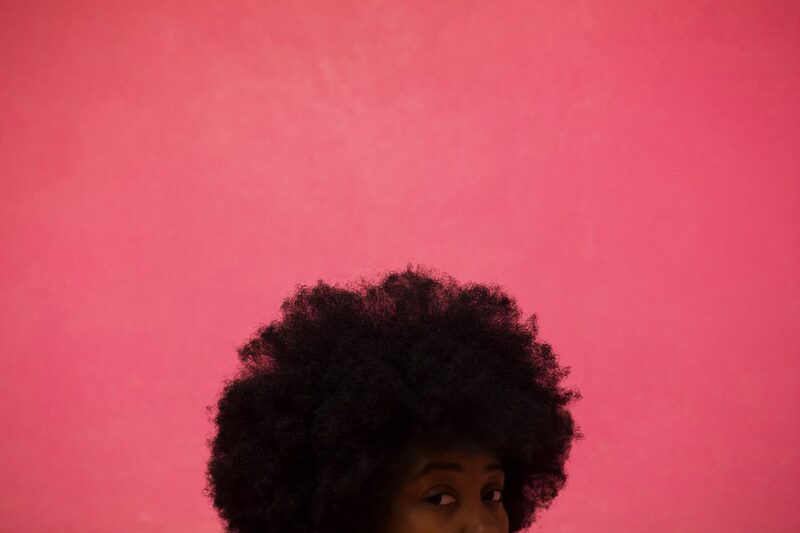 HCCT:Rmx explored further what it means when artificial intelligence is programmed to ‘create’ a world we are to live in, create art emulating the storytelling meaning-making humans do by default, using the craft of poetic language. 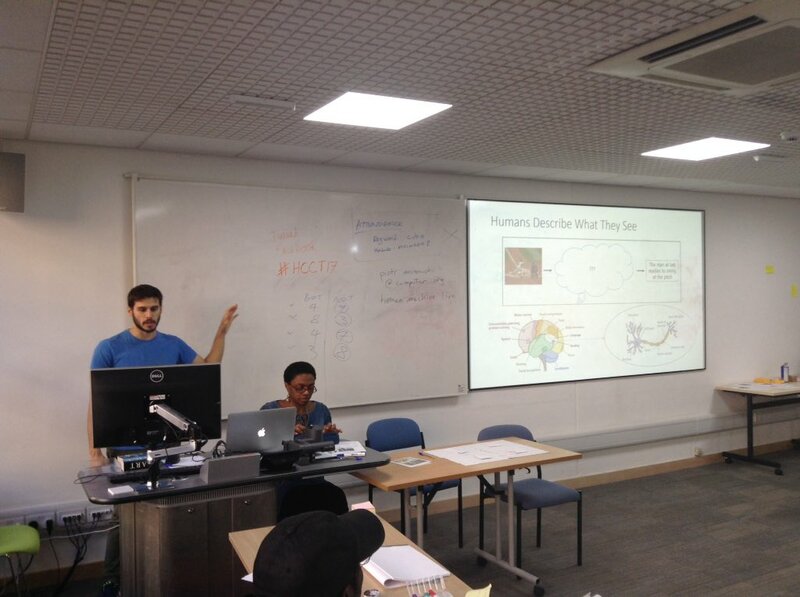 George Spithourakis, co-facilitator and AI PhD student took the participants through the construct of an AI neural network to show how closely it works like the human brain – what is put in will be become output and AI has a determining factors which inform the choices it makes when creating output. Its these choices we are want to know more about. Using the poetic device of Ekphrasis, I propositioned participants to expand on the ideas of the body having memory like a hard drive where all emotional data is stored. Then encouraged particiants to write poetry that engages the senses as code to access that memory so that we might experience it in new ways. George asked participants to imagine of AI algorithm like tree with many branches. To explain how this worked, consider this: if you were a bug crawling along the branches and twigs of this tree, you would pass leaves that were green, sunshine yellow, autumn gold, burnished red and crispy brown enough to drop on that very autumnal evening. It is these colours and their textures that would make the lines of the poem if you took a bug bite out of each leaf. So a tree with many branches and thousands of leaves give us a mind blowing combination of possibilities for how a poem would manifest. When it comes to art and cultural production, it’s the embodied, sensory experience of the natural and man-made world that infuses art with the magic our essential existence and the message of human vitality. Powerful emotions and the passions – grief, joy, anger, love, hate – are encoded in poetry in a way our bodies recognize. Our emotions are harnessed and organic body memory will always set AI and humans apart as art creators. 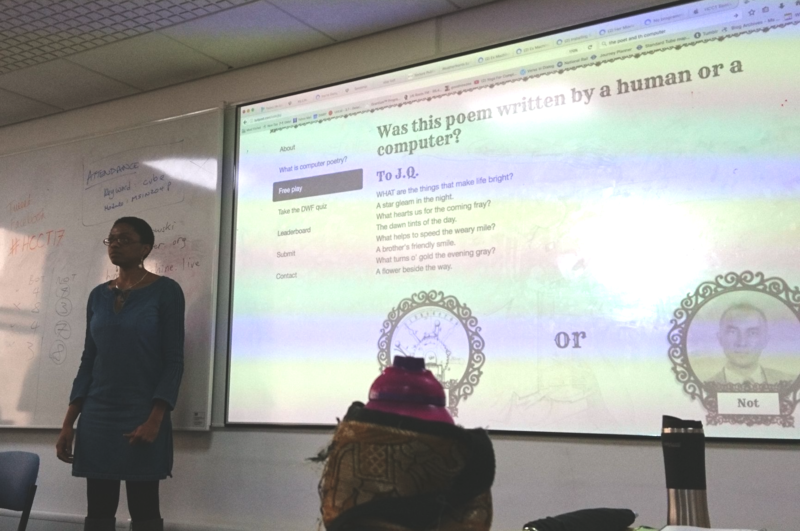 Questions asked on this day long masterclass: How does creativity and poetry inspire computer coding? How do creatives use and envision technology in their practice? How do humans make meaning from words and will there ever be a code to replace the human poet completely? And lastly but by no means leastly, on the day we, the very talented Pen Medonca, socially conscious sketch-note artist came in to document part of the day. Sketch-noting by Pen Mendonca Twitter: @MendoncaPen. So the conversation is in full flow and there will be more to come. Hope to see you at the event on the5th December. If not stay in touch with the conversation on A Human Code blog for HCCT. This is a Poetic Debaters Project initiative. brought to you by Verse In Dialog, Apples and Snakes Poetry organisation and UCL.